Two of our #TeamLymphoma runners share their experience of running the 2018 London Marathon. ‘So the marathon is over and with a chance to reflect, I look back on a hugely significant and emotionally charged event. It did not go to plan, to say the least. I took over six hours to get round, carrying the scars of more injuries than I care to mention, whilst battling record temperatures and a lack of Lucozade - but, what a day! In fact, what a few months it has been getting there. 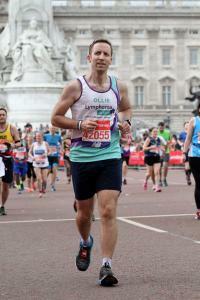 ‘I approached Lymphoma Action for a marathon place on account of my mum. She has non-Hodgkin lymphoma, which was diagnosed with 2016. I told my mum that I wanted to run the marathon in her name and suggested we raise the sponsorship money together. I was relishing the thought of doing something that would bring us together in the face of all that she had battled. ‘And, so began what has to be some of the hardest miles I have ever travelled. The support was incredible. I saw my parents at Tower Bridge and my wife, friends, and sister were between the finish and I. Despite the delirium, doggedness, and two occasions where I actually had to stop close to tears, I made the finish and (somehow) ran the Mall. ‘When I set myself the crazy challenge of training for the London Marathon just over a year ago, I could think of no charity I would want to run for more than Lymphoma Action. My mum has had Hodgkin lymphoma twice in the past 10 years and so it’s a charity very close to home. Thankfully, she has beaten it but I wanted to support those families who are facing a similar situation. ‘As the day approached, I was training as much as I could but upon arriving at the start line, I was absolutely terrified. My nerves were eased by the friendly people I talked to whilst waiting to set off. I discovered that they too had never run a marathon and were feeling equally as nervous. And, you know what? It was hard but I enjoyed every minute of it! As each mile passed, I kept reminding myself why I was running and the fantastic cause I would be helping, and that kept my legs moving. ‘Once I had crossed the finish line, the elation properly set in. I became extremely emotional. A warm welcome at the charity reception afterwards was just what I needed. It was lovely to meet those personally involved in the charity as well as other runners. Find out more about representing #TeamLymphoma in one of our fundraising events.